If you’re struggling with the Monday blues or just have some built up stress, “Doc MacDoodle’s Color Therapy for Grown-Ups: Animals” by Bridget Finnegan is perfect for you! This adult coloring book is a lot of fun and really does help to relax and take your mind off the worries of the world. The goofy and fun animals on each page make you smile and coloring them funky colors makes them even better. The fact that each doodle has a blank back is a plus! You can rip them out and hang them up on the wall or fridge to enjoy your masterpieces even more. The best coloring utensil would have to be color pencils or gel pens. They have a finer point for some of the more detailed pieces. Markers and crayons were okay for the simpler doodles but found them to be a little too large for the more detailed doodles. I personally enjoyed coloring the smaller peacock in the book. It had a lot of small details to make it pop and each feather had a different design on it. The end product turned out to be a beautiful pink peacock with loads of different vibrant colored feathers that made it come to life on the page. It definitely helped me relax after a long rainy day at work. My mind was more at ease once I was done which helped me fall asleep faster since I wasn’t worrying about everything I had to do the next day. I cannot wait to color some more funny animals. 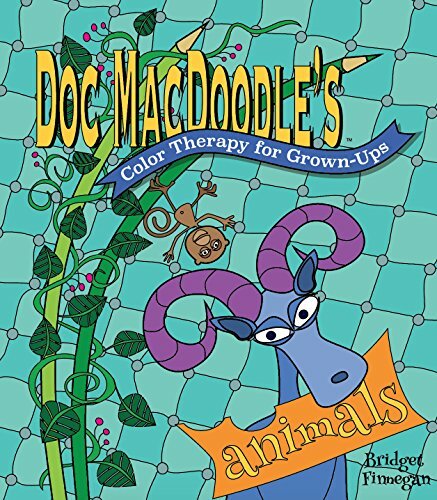 So if you are in need of a fun and creative way to unwind after a busy or stressful day I definitely suggest you get “Doc MacDoodle’s Color Therapy for Grown-Ups: Animals” by Bridget Finnegan and color your worries away.